• Study practical aspects of spirituality through classes and workshops. • Discover new methods to handle life’s challenges. • Enhance or begin a meditation practice. • Appreciate time spent in solitude and silence in beautiful surroundings. • Enjoy the rejuvenating effects of a pure, serene, and spiritual setting with vegetarian meals. • Meet like-minded people on a similar journey. • Relax in comfortable rooms with private bath. All accommodations are shared. The weekend will include sessions by experienced retreat facilitators on personal development, spiritual wisdom, and resolving problems through understanding spiritual knowledge. • Children below 12 years are not allowed as the attention of yours and others might be deviated. • Please bring your essentials like one pair of dress(any color), towel, toiletries, water bottle, medicines (if any), lock & key for the valuables etc. • Plan to use your mobile phones as less as possible. Best is to keep it switched off. Please plan accordingly. • Consumption of alcohol & tobacco in any form is strictly prohibited. • Voluntary Contributions can be done through cheque also and IT exemption 80G certificate can be availed for the same. 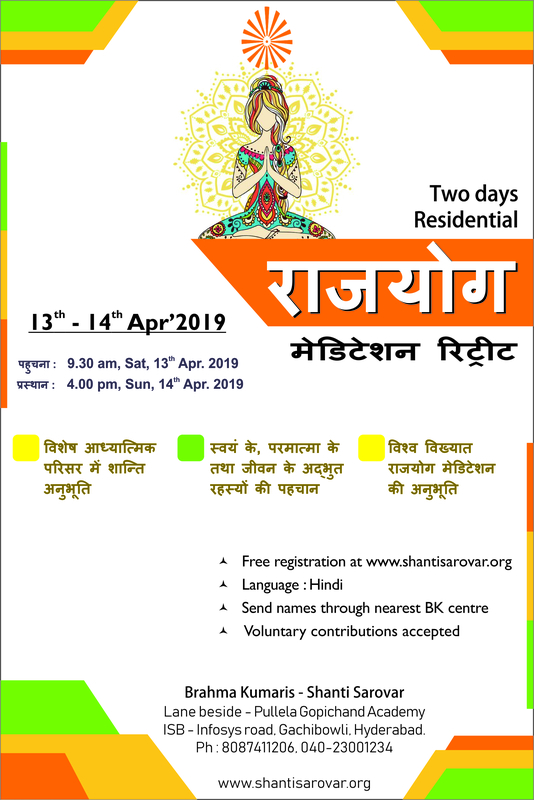 • Your food, accommodation & retreat arrangements are in the divine premises of Shanti Sarovar itself, you need not take the trouble to leave the campus in these two days or bring any outside food during this 2-day retreat. • Try to maintain silence as much as possible in the premises.